Profile: A quick glance at Weirdwolf's motto might lead you to think that it's either a typographical error or this particular Decepticon has some seriously crossed wires! We're happy to say that the latter is true. Though possessing hyper-keen senses and an alert, sharp mind, Weirdwolf is something of a mess in the neural department. We all occasionally talk to ourselves, but the trouble with Weirdwolf is that he does it all the time. And in an uncomfortably loud, sing-song backward way. "Destroy the Autobots I shall. Rip their faces off how nice it would be." and so on. This habit doesn't impair Weirdwolf's abilities. He's cruel, vicious and incredibly deadly. But it does unsettle his fellow Decepticons, especially in the midst of a tense battle. Weirdwolf is binary-bonded to Monzo, a brutish professional hyperwrestler-turned-underworld-nightclub-owner. If Weirdwolf was lacking anything in the sadistic department before, his Nebulan partner more than makes up for it. The two are ideally matched, delighting in the pain and carnage they deal out with savage abandon. These two like minds, constantly seeking the thrill of combat, have no room left for fear, making Weirdwolf a warrior without compare. The only trouble is, as Headmaster, the internal conversations are sometimes three-way! 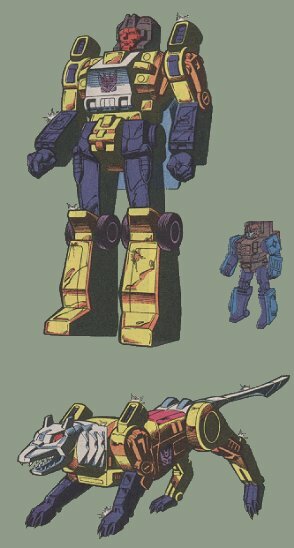 Abilities: Though in robot mode Weirdwolf wields a photon pistol (firing high frequency energy particles) and a thermal sword (capable of cutting through steel three inches thick), he tends to rely heavily on hand-to-hand combat. Although he strenuously denies it, it is widely assumed that this is Monzo, unable to forget his time as a professional hyperwrestler, exerting a controlling influence on the shared mind. Weirdwolf doesn't care. Up close suits him just fine, because it enables him to switch to wolf mode and use his tungsten-tipped claws on hapless Autobots. In this form, Weirdwolf comes equipped with nose module tracking sensors, capable of reading smell, infrared heat images and air current patterns. He can leap eight miles in a single bound. Weaknesses: Weirdwolf's crossed mental wires can sometimes ruin an otherwise faultlessly silent approach. Just when he's ready to pounce on the unsuspecting Autobot he's been tracking for the last twenty miles or so, he'll open his mouth and say "die you now!" and ruin the whole thing! It's become so like thinking to Weirdwolf, he doesn't realize he's speaking aloud.